I don't follow this as close as some of the others here, but that certainly looks like some open waters to me. I think there were something similar last year? That open water - at the bottom, slightly to the right of middle - on the Sentinel image is the open water to the north of Svalbard, that can be seen on the Uni Bremen SIC map that plg posted. I believe plg is referring to the reddish smudge north of that, which looks like it's solid on the Sentinel image. It looks like an open wound, but I am not skilled enough to differentiate between clouds and ice. But, if it is not an artefact, is this not very unusual in January? It would be unusual, and could only be explained by massive transport due to very strong northerly winds (which aren't there as of now). Melting on such a local scale would be highly unlikely, unless some very strange upwelling of warm waters would be occurring. But it's an artefact, and these aren't unusual on the Uni Bremen SIC map, whatever the time of year. My rule of thumb is that if it's there for three days in a row, it might be something. Is the red patch at 45E 80N for real? In January? You are absolutely correct Neven, looking a bit further north there's nothing visible via Sentinel either. Bummer, I crashed page 6 for nothing. Jim, for me UH AMSR2 did not update for a couple of days (latest is 21 Jan). Where did you get an 25 Jan image, if the file name is correct? plg, here's the cut out of the high res I tried to add earlier. I see definition and structure inside of the darkened zone. There do seem to be polynyas. Further, precipitation and a burst of heat and wind from the latest storm to reach the region has just passed through. My impression is low clouds over fractured ice, and possibly wet snow delivered as recent precipitation. At a time when we have concerns about the north Atlantic drift losing speed the run of storms with a strong southerly draw appears to have piled warm waters into the pack edge? I wonder if this is all in my mind or whether the anoms on our side ( Atlantic) of the basin do reflect the frequent occurrence of powerful storms pushing southerly winds up into the basin ( and driving the ocean surface before it?) . Do we know how far under the ice these anom temps are driven and whether we ought to expect a rapid retreat of the ice edge this spring due to pre-conditioning by this anomalous weather? Comparing these two, most of those darker areas are gone on the 25:th but that crack has gone further east. The one on the Svalbard side reports that air temperatures managed to pop over "unfreezing point" briefly. Surface temperatures on the other hand, did not. 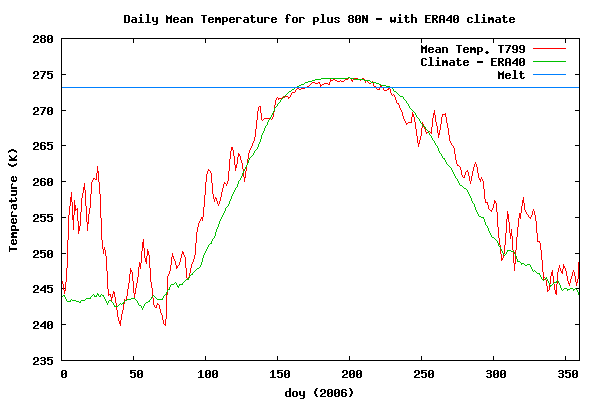 Indeed, but the most recent parallel is 2006, with the highest summer minimum for a long time. I recall somewhere on the forum reading a discussion of the use of degree days as a proxy for understanding changes in volume. I shall have to dig a bit. There are considerably fewer this year for sure. The Arctic is in the teeth of that heat and surf as was predicted and the numbers reflect it. I was going to say GFS shows some relief in a few days which would permit extent to climb again, but saw that relief was over the CAB proper. Cold over the basin is good for thickening but doesn't add a lot to area and extent. The areas which most need cold to increase extent - particularly the Bering , Barents and Greenland seas - are all still predicted to be under a torch for the foreseeable future. With that heat, it would be no surprise to me if we found "Surf's Up!" In those peripheral seas as well. My confidence is growing that we will see a new "min-max". Well, last year the record low max for JAXA SIE was reached two weeks and a half from now, but for today's date 2016 is still 147K lower than 2015. So, it's definitely becoming more possible. Exciting. For the time being we have CT Global SIA to keep us distracted. I did a bit of tinkering with the NSDIC extent data from 1979 to 2014. I looked at the difference in extent between 1/30 and the Max for each year. (Edit - I need to re-work my numbers). We have a high probability of a max between 13.5 and 14 million KM2. If we have a bad melt year = 11.5 million KM2 as in 2012 (iirc...) - we could end up with a minimum around 2.5 million KM2. If we fall on the low side on max and maximum melt on the minimum, it gets quite a bit worse. Max of about 13.7 million. Final 2016 minimum of ~2.0 million KM2 extent. Those numbers are currently in play. Not our sub 1,000,000 "ice free" arctic, but hopefully (if it happens) a whack off the side of the heads of our leaders sufficient that they start paying attention. The race with 2006/10/11 is currently quite close though. 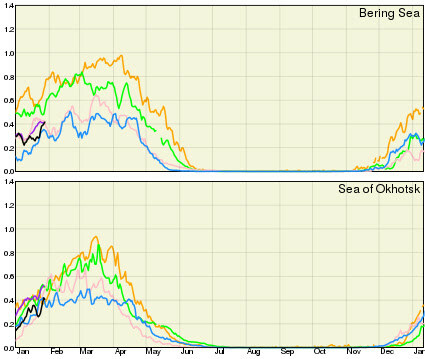 It is interesting that the leveling off of sea ice growth occurs at the same point of the freeze season? After 07' they looked into the recurrence of the 'perfect melt storm' synoptic. They found a 10 to 20 yr period in the phenomena with the two prior to 07' favouring a 10yr period. Now if we haven't totally goosed the climate that could mean melt season of 2017 is the earliest it could be expected to return? Should we suffer a sub 3 million min this year then that would leave us in a pretty poor position to face the possible return of the perfect melt storm in 2017 wouldn't you think? Shared Humanity writes: "It is interesting that the leveling off of sea ice growth occurs at the same point of the freeze season?" Nope, just sunrise and sunset. The annual solar cycle. I.e., Barrow, at 71.2N, didn't see the sun for two months - it only reappeared on January 23rd - for an hour. It's up to 4 hours per day now in Barrow. The long winter arctic night is slowly ending and the sun making its reappearance. I assume Shared Humanity was referring to 2006, 2010, 2011, and 2016 all levelling off during approx last 10 days as shown on graph posted by Jim Hunt. Other years don't generally show that pattern. Just co-incidence? The years were selected as lowest at this time and perhaps that makes them likely to have got to there by weather causing a level patch because the alternative of a fairly steep rise to this point would mean they were exceptionally low several days ago and that is unlikely? Considering that the Arctic temps were well above normal during the last 3 or 4 days of 2015, we now have had in excess of 30 consecutive days with temps in excess of 5o C above the long term average. This must have some eventual impact on the final maximums of area, extent and volume. How much....I don't have a clue!! I think it's all about FDD's - freezing degree days, OL. We're short a bunch of them, this year. The higher temperatures mean a much lower gradient between air and water, thus less heat flow. In net, there is a whole bunch of heat left over from last year still in the water. Thanks. That's what I meant. This is not all that surprising as most of the enclosed seas are now full and have no room left for further increases. Only the Barents, Bering and Sea of Okhotsk have significant open water boundaries, and this is where most of the growth in January comes from. Because of the geography of these seas these boundaries increase during January so the fluctuations after that become larger. Neven, isn't the smudge at the approximate location where Climate Re-analyzer showed the path warm air was moving into the CAB, earlier this month? Now, it looks like there is a warm air blob sitting over the spot. We have been watching a seemingly endless stream of powerful Atlantic lows driving huge masses of warm air into the polar regions. Surface temps hit freezing at the pole briefly. Wouldn't these storms tend to drive the unusually warm waters into and under the ice edge as well? Are we actually seeing ice melt in the middle of the freeze season? I can't imagine that's it. My first guess is divergence. How long till LANCE-MODIS gives us a glimpse? I'm lazy, BTW. It's not really north of Svalbard, but rather Franz Josef Land. I can't see anything particularly out of the ordinary though? Moreover, what should be of a concern right now is the latest runs from ECMWF is the distinct possibility of the return of RRR - Ridiculously Resilient Ridge... Just look at the ECMWF 12z run... The question is whether this is a temporary thing or a more dire and persistent pattern that will reemerge as ElNino now is fading.. Finally, there are some indices that the sea ice thickness in the CAB and also theLaptev Sea is stronger than it was during 2010-2012. Have you seen this relatively new ASCAT product from IFREMER? It seems to get updated in batches, so isn't exactly NRT, but is much more colourful than the standard ASCAT output! According to http://cires1.colorado.edu/~aslater/ARCTIC_TAIR/index_80_t2m.html we are about 500 degree days warmer than the average and for the last week the warmer than all years up to 2010. I've been watching the forecast for that high developing for a couple of days. It's a good news/bad news, especially if it is very strong and generates a lot of circulation. The end of the week shows the worst of the "spike" of heat disappearing and near-normal (2-3C above average) temperatures showing up over the CAB. There's still a lot of heat around the edges however, with 10-15C anomalies being fairly continuous. The downside - US Navy ARCc has Fram export going into overdrive and shipping out large quantities of the thicker 2M+ ice. The model suggests some push of older ice into the Beaufort as well, but its not as dramatic. I haven't seen that yet, no. Definitely looks more colourful. Too bad there is no way to compare to previous years (or is there?). Thanks for this, Andy, just what I needed to fill up a hole on the ASIG's Daily Graph's page. I was aware of Slater's excellent website (there are already a couple of graphs on the ASIG), but somehow I had overlooked this excellent FDD graph. I've added all those graphs to the bottom of the ASIG Daily Graph's Page. I've also added a link at the top to your Resources, Jim. I can't believe I didn't do that earlier. Sorry about that. Even the most ignorant denialist got to consider this as a sign of a warmer era. So, SIA/SIE in the Greenland Sea, which is low at the moment, will probably go up. And if the cold anomaly comes about in the Sea of Okhotsk (and perhaps part of Bering), trend lines may shoot up there too. But will it be enough to prevent a new record max? They were indeed already linked at the top left of the page. I have used that link on many occasions. So now Jim's resources are listed twice, which is not such a bad thing considering they are great resources! however to keep things up to date i started to make my own stats. So I did put in a link after all! God, I'm good (except for my memory, that is)! Okhotsk appears to be the key target of cold outflow out of the CAB. Over all, I do expect to see a sharp uptick in coverage. Not so much the Bering, I think. I see no relief for the Barents, Kara and nearby CAB. I'm ambivalent about declaring that we will see a new min-max. The probability range for further extent increase easily encompasses the Max sailing well past 2015. However, just the high possibility - better than 50% I think - of a new low max causes one to sit up and take notice. I think the degree days are going to be the story. I don't think there is enough time for heat export to catch up before we see enough insulation at high latitude to offset it. QED, late cold, even extensive in the eastern basin, Laptev, ESS and parts of the Chukchi will not provide enough thickening for ice to get much past 2M, *if* *that*. I suspect we will see the western Kara and Barents clear very rapidly and early in the season. If we have early melt ponds, it cold be very serious, as I think even if extent recovers, the ice will be weaker than last year. Just been busy with quite a bit of heavy duty personal stuff lately. I still maintain all kinds of volume, extent, area, and temperature numbers; I just haven't updated some of the graphs in a while. However, now that melt season is nearly upon us, however--and possibly a very interesting one at that--and now that my personal issues have been (mostly) resolved, and now that several people have goaded me into catching back up, I'll begin updating again. As I just now did.